Does your home’s electrical system pass the test? 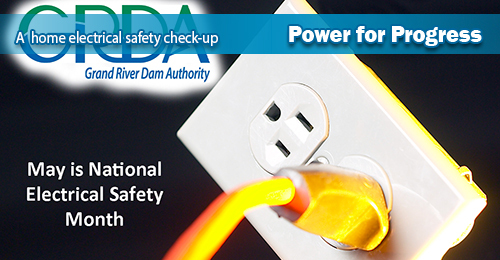 This week, in recognition of National Electrical Safety Month, GRDA passes along some tips on how to give your home an electrical system checkup. during the month, the Grand River Dam Authority is passing along some important tips from ESFI. This week, in the final installment of our three-part electrical safety series, we wanted to share some tips on how you can give your home an electrical safety checkup. You can do that by asking these questions. Are all your switches and outlets working properly? If the answer is no, remember that improperly working switches or outlets may indicate an unsafe wiring condition, which could be a fire hazard. You need to have a licensed electrician check these switches and outlets. Are any switches or outlets warm to the touch? Unusually warm switches or outlets also may indicate an unsafe wiring condition. Stop using these switches and outlets until a licensed electrician has inspected them. Are outlets or switches discolored? Discoloration signals a dangerous heat buildup at the connection. Again, until they have been checked by a licensed electrician, do not use these outlets or switches. Do any switches or outlets make crackling, buzzing or sizzling sounds? Unusual noises from a switch may also indicate an unsafe wiring condition. Once again, it needs to be checked by a licensed electrician. Do your plugs fit snugly into all outlets? Loose fitting plugs can overheat, also leading to fires. Once again, these need to be checked and/or replaced by a licensed electrician. Just like we all need a wellness check in order to maintain our own good health, our home electrical systems need these type of routine checkups to maintain proper electrical safety. For more information and safety tips, visit www.esfi.org.